No job is too big, no job too small for this company! Business: C & C of Brevard, Inc. located in Port St. John. 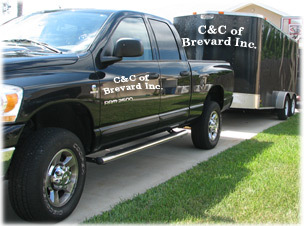 Business description: C & C of Brevard, Inc. has been in business for since 1989. The company provides carpet and upholstery cleaning using biodegradable products. C & C of Brevard, Inc. also is among the few local companies specializing in tile and grout cleaning. Professional background: Work is done by technicians certified in carpet cleaning. They also have years of experience in tile and grout cleaning. Personal: St. Amant enjoys weightlifting, football, motorcycling and his family. Business motivation: "To prove to the customer that C & C of Brevard, Inc. is one of the best carpet cleaners... no gimmicks." Best business experience: Taking advice from successful companies that are honest in the field. Business goals: "To have two truck mounts running instead of one so I can hand it down to my son and his future family." St. Amant said.